The first “Mars Utah Rover Field Investigation” run by the UK Space Agency and the Canadian Space Agency. This daring project will involve the operation of a Mars Rover test platform in Utah, while controlling the Rover and its scientific instruments, will be a Mars Operations Centre or MOC (we just love those acronyms!) based in the UK. The MOC is housed on the Harwell Campus, near Oxford. There are lots of reasons why Rover trials are useful but the main reason is that they provide informative, safe and cost-effective ways for scientists and engineers to gain experience ready for real planetary missions. The MURFI mission is designed mainly to help the UK team gain experience ready for the ExoMars 2020 Rover – an ESA mission that will drill down into the Martian surface to look for signatures of ancient life. The MURFI team is split into two groups, the Field team, who will be in Utah are looking after the Rover and its instruments whilst pretending they are on Mars. Then there is the Operations team sitting in the MOC, pretending that the images and data they are looking at is actually from Mars. There are scientists and engineers involved from several Universities and organisations, collaborating in person, remotely and from across the Atlantic. Importantly, MURFI is a “blind” simulation – the Operations team in the MOC won’t be allowed to talk to the Field team, or know anything about the local environment, or even where the Rover “landed”. All they will know is what they can glean from the data the Rover sends back, and from “Mars-like” satellite images already acquired. The main MURFI mission kicks off next week, 31st October, with a variety of practise runs followed by a formal 8-10 day simulation mission starting on the 3rd November. The final week we’ll be closing the MOC, and doing joint operations with the Canadian Space Agency. 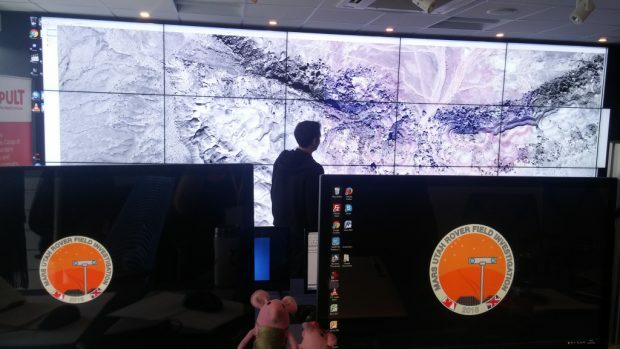 Although the Field team in Utah are just arriving and getting set up, the team at the MOC in Harwell are extremely busy making sure all the various software and hardware are ready and working, and are spending time trying to unravel the local geology at the “landing site” in Utah. We are only using the data we would have as if we were on Mars – that is, orbital imagery. We’ve tried to make this as Mars-like as possible, so the image resolution of our data is similar to the data sets returned from Mars, like the HiRISE (25 cm/pixel) or HRSC (12.5 m/pixel) cameras. Peter Fawdon, Mapping Lead, viewing the landing site in Utah. We want to know the locations of good targets for the rover to go to that meet the mission’s science objectives. In the case of the Curiosity Rover, these are outcrops of rocks that may record evidence of past environments that were friendly to life. For MURFI, as this mission is based on ExoMars, we’re interested in finding rocks where evidence for extinct life might be preserved.